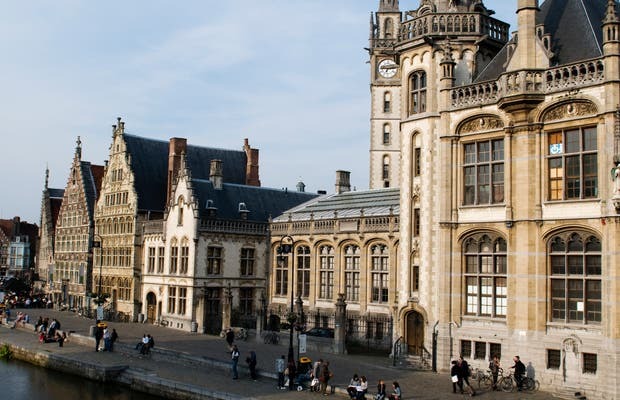 Next to Muelle de los Granos and the Hiervas you can find the Guild House Grain Meters, the Guildhall of the Free Boatmen, the Wheat house ... Each house has its own history but together they are testimony to the huge growth of the economy during the Middle Ages in Ghent. In most of the original buildings only the facades are preserved. Behind some of the facades a new hotel has been built. In one of the two sides (I forget which) you can take a little boat for a ride down the river. It is an ideal place to sit and relax and enjoy a nice view.